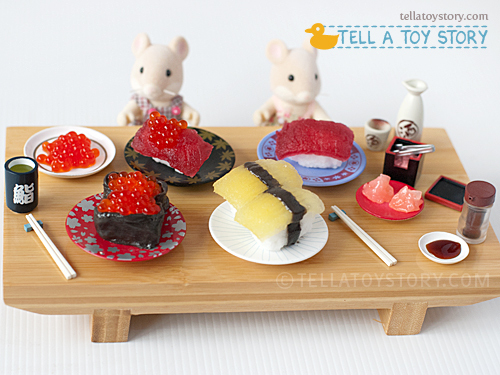 Last weekend, The Hamilton Hamster Family from the Sylvanian Families neighbourhood enjoyed a cozy family sushi dinner. They ate the traditional Japanese way – sitting down on the floor. 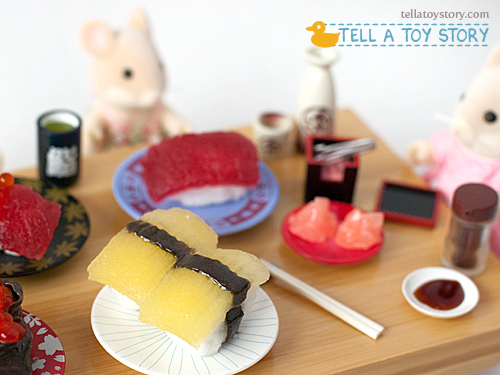 The sushi on their table are not toys – they are edible gummy candy made to look like sushi. 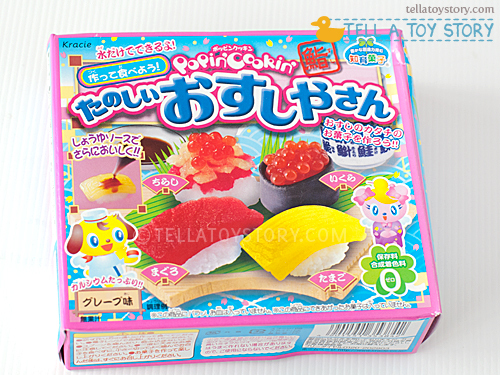 The sushi were made from popular Japanese series of edible gummy (grape flavored jello/gummy/soft candy) kit: Kracie Popin’ Cookin’ Candy Sushi. The product do not contain artificial colours and the gummies are candy flavoured. 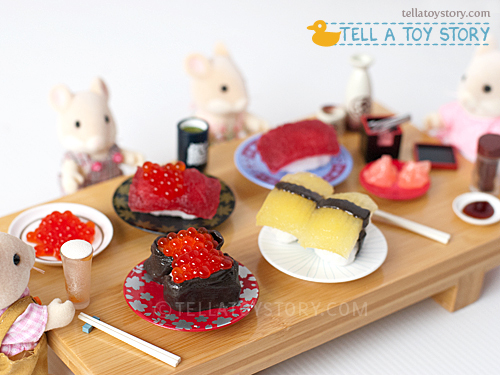 Papa hamster’s (left) favourite is the salmon roe (ikura/イクラ) so the roe is nearby. He also have an extra plate of salmon roe to go with his ice cold beer. 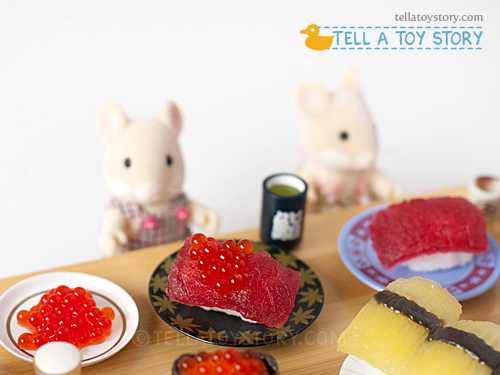 The hamster furkids’ favourite are tuna (maguro). Can you see the grain lines and slightly moist texture on the tuna? They look just like the real thing. 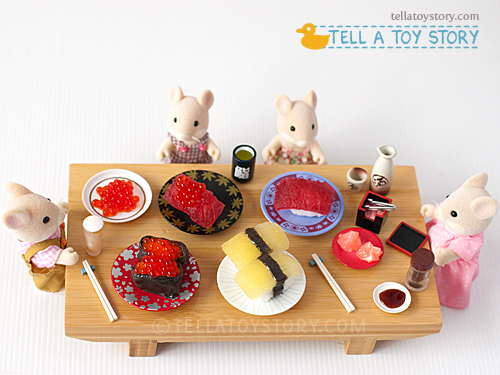 Mama hamster’s favourite is the omelette (tamago) and she like to dip it in Japanese soy sauce (shoyu). Can you tell which are the edibles and which are not? 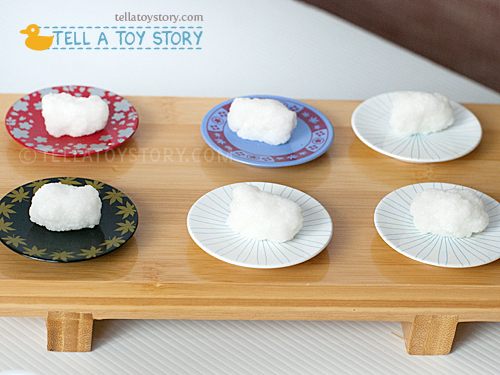 All the sushi and the saucer of soy sauce are edible. The drinks, ginger and soy sauce bottle are props, taken from my miniature food collection. The table is an actual sushi wooden plate, and converted to a hamster-sized dining table just for the Hamilton Hamster Family. 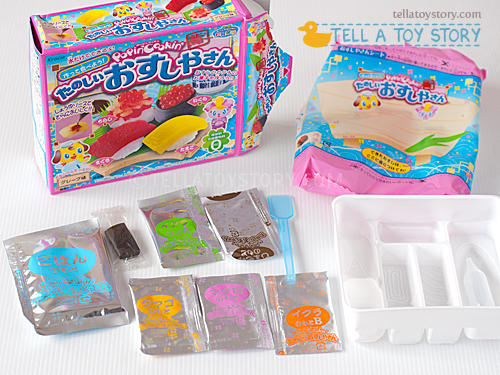 Unboxed – the sushi kit comes with the above – one mould, 6 packets of gummy powder, one seaweed dough, one water dropper and one spatula for mixing. If you watch this video by RRcherrypie, it will give you a very good idea of what this is all about and how to make the candy (the instructions on the box are Japanese). A closer look at the provided mould, spatula and water dropper. You need to add fresh drinking water to mix with the pre-packed powder. 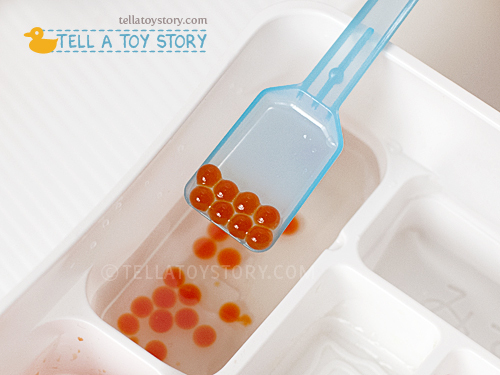 You can use the top compartment in the mould to hold the water but it is handy to use our own bowl. 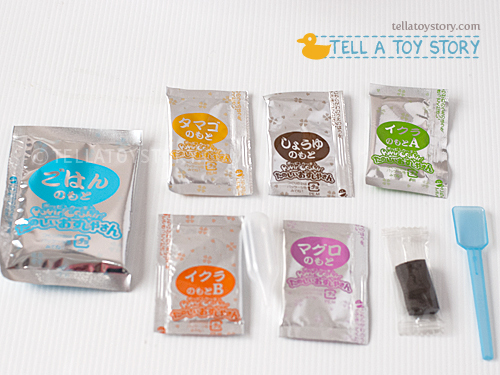 Various sachets of powder allow you to create different parts of the gummy sushi. The “seaweed” comes in a ready-to-mould form. The water dropper is handy when adding water to the powder. You need it for making the salmon roe too. Completed “sushi rice” ready for topping. Making the “ikura” or “salmon roe” is really fun. Just squeeze them into the mixed solution and perfect translucent “roes” appear instantly! The salmon roe can totally pass off (appearance wise) as the real thing – they are slightly transulcent, moist and just the right shade. Have fun making and eating your own gummy candy! where do we get it ? You can find it at Toy Outpost (those rental cabinets) in SG Shopping malls such as Vivocity and Plaza Singapura too.